Campaigners in Richmond County, North Carolina. Photo Dogwood Alliance. 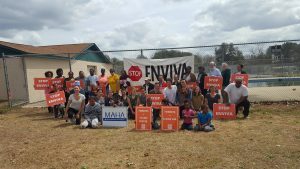 Along with other organisations worldwide and in support of our allies in the southern US, Biofuelwatch has written to Secretary Michael Regan in Richmond County, North Carolina, to share our concerns about the planned expansion of the wood pellet company Enviva’s facilities there. The wood pellet industry in America’s south is accompanied by a pattern of environmental injustice, air quality violations and forest destruction, often hitting hardest those already affected by other industrial pollution and social exclusion. Enviva’s proposed expansion is fuelled by a growing global market in biomass wood pellets. This is especially relevant to the UK as Enviva’s largest customer: Drax Power Station in Yorkshire, sources 59% of the 6.5 million tonnes of pellets it burns each year from the US; Lynemouth (a former coal-fired power station in Northumberland) and MGT power stations (the world’s largest purpose-built biomass power station, under construction in Teesside) have contracts with Enviva for around 2 million tonnes of wood pellets a year between them. The UK continues to burn wood pellets from these forests because our government subsidises the burning of biomass, in the false assumption that it is carbon neutral. In 2017, power station operators received around £1 billion in “renewable energy” subsidies – paid out of a surcharge on our electricity bills – for burning wood. Biofuelwatch believes that this money should instead be going towards genuinely renewable energy from wind, waves and sun and that we need more support for energy conservation and demand reduction. You can read our letter to Secretary Michael Regan here. Email your MP asking them to scrap subsidies for burning wood and redirect them to genuinely renewable energy here. Find out more about Enviva’s plans, and make your own submission to North Carolina’s Department of Environmental Quality here.